I can't believe it is over. I can't believe I did the whole thing. I can't believe so many of us did the whole thing. I would like to continue, but I think I have a writing project now to finish. I will post Tuesdays and Fridays for almost sure. And either Wednesday or Thursday, if I can swing it. We will see. I need just a little break, but not too much. I at least have to see if I can get something in print. I said I was going to, but haven't done it yet. Write Club starts soon! Aaargh! Must be ready. So I really do need to give my brain a change of pace here pretty quick. 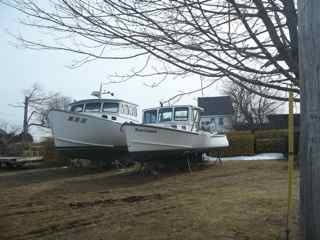 The lobster boats are just waking up from their hibernation, and heading back to the water this week. I got pictures while they were napping - just in time! It's harder to get pictures when they are on the move. So Z last lobster boat and poem is here. First word - yare, a new word for me. Thanks, rch over at Average Poet for the word yesterday. I had my poem written, but rewrote and added some to get this word worked in! I love learning new words! 2. Nautical Responding easily; maneuverable. Used of a vessel. Thanks for all the kind words this month. It has been a fun 26 days! I hope you will keep in touch with continued visits. I will try to get around to doing the same! There are so many good blogs out there, and so little time! But I'll do my best! Zoe A. Zanidakis (ZAZ), Monhegan Island’s only woman sea captain and a contestant on Survivor. 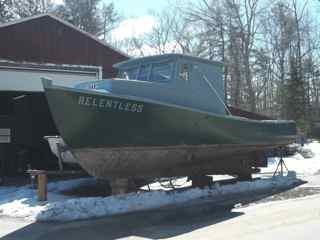 Larry Mills and his son Gary, in 1976, designed and built a steel lobster boat named "Zephyr." 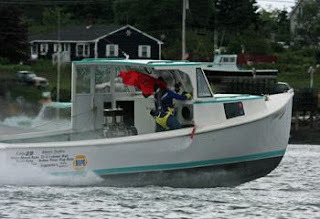 Here is the schedule for the 2013 Lobster Boat Races in Maine this summer. 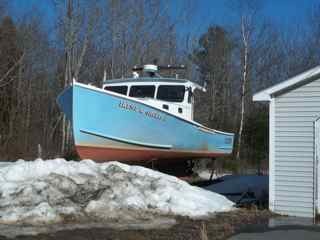 You may see some of the lobster boats I've written about this April. If you get a chance, stop by Maine sometime...the bad part, is you can't easily get here on your way to somewhere else. You have to come here on purpose. Next stop Canada or the Atlantic Ocean! 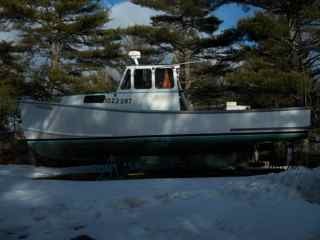 Now this next boat...YYY may just be a no name and the YYY is part of the registration number. But since there were no other numbers there - I'm taking it! I haven't found any other Y names yet, so this is what I'm going with! Isn't she cute? 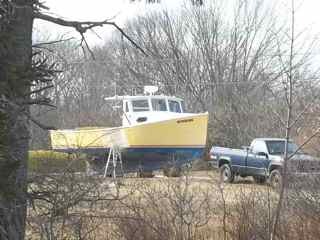 She reminds me of Sunrise, my S boat, only a little deeper yellow and a dark red bottom. She looks more like a sunset to me. And tomorrow, (drum roll) the letter Z for z end! I cannot believe that I found it! Well, I didn't find it. A friend found it and sent me the url. Thanks, Ree! 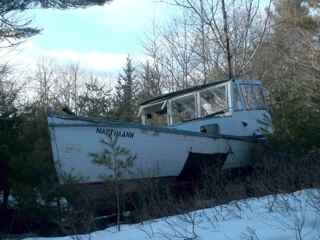 I did not get to use this boat, having found it after letter J was published. I have more boats than I can shake an oar at. I'll just add them later. This is a pre-written post for Sunday. Since mine were almost all pre-written, I decided I'd still do a poem on Sundays. Why not? I'm not writing them on Sunday, and I'm not even posting them; they're automatic. So I am good to go. I can write one for Sunday and just not be there. So know that if you comment on these, that I will just be a day late in responding to you...(even though I may take a peek at dinner time). Oh, and if you get a chance - and you are here anyway, because you are reading this now...PLEASE check out X on Saturday! It was so hard to find an X, and I was so pleased to have found it. And X (for Xtreme Measures) has such a neat story to go with her, that I would so like to have more than only two people to have read it - thanks Catherine and Sania for checking in, reading and commenting yesterday! It's Sunday, and it's come just in time. 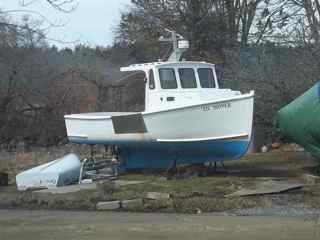 Another boat left off my poem list is Illusion. I'll catch the illusion later and give it a real poem shortly. X has been found, really found! It's the A to Z Challenge, and letter X is for today. 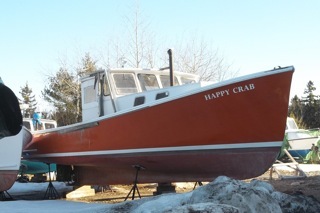 I have been searching for a lobster boat that begins with the letter X for quite some time. and I found it a couple of days ago. I have not yet met Xtreme Measures in person, but found its news article online. 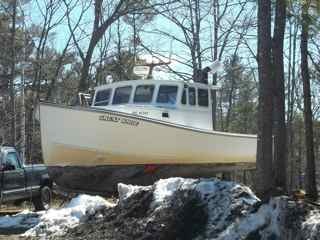 It is a lobster boat that was lost off Spruce Head in a blizzard. It had been lost for 10 days in February, but was located adrift about 150 miles away. Story here: Bangor Daily News. It's Friday and the letter is W in the A-to-Z Challenge! 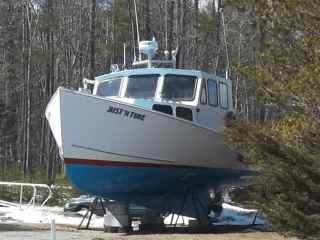 My theme - lobster boat names in Maine and an original poem to go with each. Visit more great A to Z posts by clicking on the tab above. 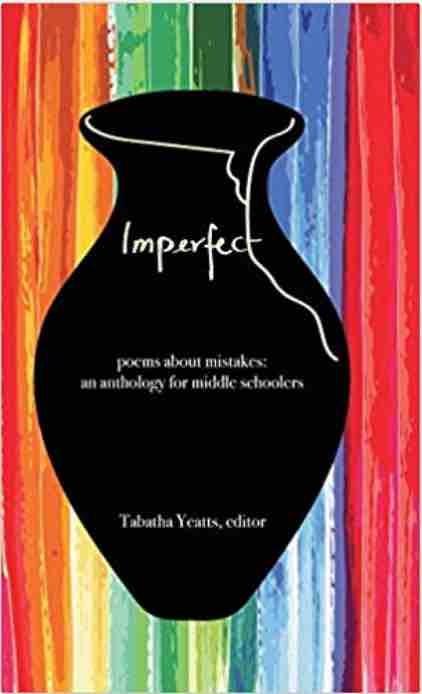 It is also Poetry Friday, so click on the Poetry Friday link on the side to find more great links to poetry! So here we go with War Horse and Waffle! Warm weather's coming, begone you cold snaps! I want to be soaring, yes, I want to fly! Waffle? I didn't stop to ask. Maybe it's a good way to start the day? 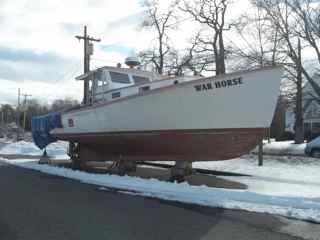 War Horse is for sale. Just sayin'. 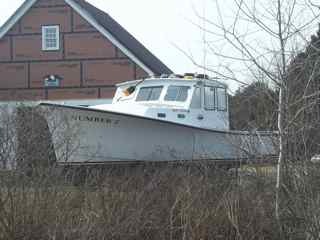 Yes, Virginia, there is a lobster boat name that begins with X.
a Z has been found! Phew! 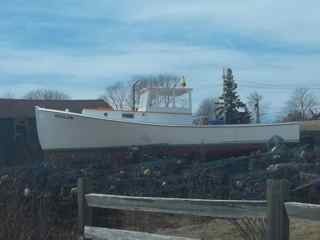 My lobster boat trip through the alphabet will be complete next Tuesday! 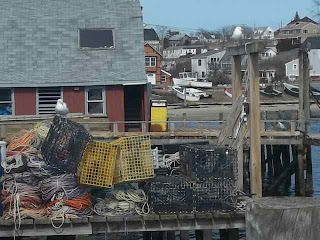 Valerie J is peeking through the rails, grounded at dock - not a common situation for a lobster boat. We heed high and low. V-tail or V-notched = A notch in the flipper to the right of the center flipper. If a berried female (remember that means she has eggs under her tail) without a notched tail is caught, the lobsterman cuts a notch cut in her tail and releases her. If a lobsterman catches a female with a notched tail, he must release her; as it means she is a breeding female. After a few molts, notches grow out and the lobster is a legal catch (unless she has eggs again of course). Well, U is for unable to get my own pictures. I finally found a picture online of one Maine lobster boat that begins with U - Underdog! I have to credit Sam Murfitt for the picture here. It all turns out well in the end, after a concussion and a broken arm, anyway. 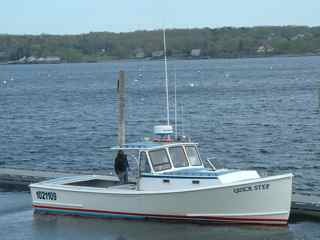 Then I found the interview that mentions a second lobster boat name that began with a U. I doubt is still around, but maybe. Quite a while ago there WAS a lobster boat called the USS Alabama. 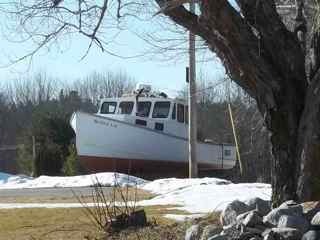 I stumbled upon this interview of a lobsterman in Friendship, Maine. I think he's in the family of the person we bought our house from in Friendship. He named his lobster boat the USS Alabama, after the boat he was on in the service. This interview is one of a few that were done as a school project. I'm thinking of saving the pages in case the school decides to take them down. There's some great information at the interview with Stan Simmons. Ooooh, and I JUST found this other boat! Uncles UFO! Two U's! I don't have a poem for it, because I JUST found it. But here is a You Tube video of Uncle UFO racing Whistlin' Dixie in 2009. This video is taken aboard the lobster boat Uncles UFO. It's pretty cool to watch and not too long. It's Tuesday and it's T in the A to Z Challenge (see tab above for more participants) and it is Slice of Life Tuesday over at Two Writing Teachers (see navigation button on the right to get there)! I also have an afternoon meeting, so will try to connect with people the best I can. It's going to be a busy day! Their gear and high hopes. Tomalley: The green stuff in a cooked lobster. It's the liver, and is edible. My grandmother loved it! I can live without it. It's Monday and the letter is S in the A-to-Z Challenge. 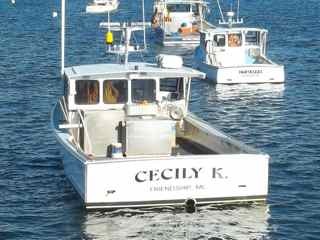 My theme - lobster boat names in Maine and a poem to go with each. Visit more great A to Z posts by clicking on the tab above. Over 1700 bloggers are participating, so I know there will be something in the list that will be your cup of tea. Of course, I'd love to have you keep coming back here too...maybe even sign up to follow my posts! And dot these Maine shores. Shorts: lobsters that are too short to keep and sell; the carapace is less than 31/4" long measured from the rear of the eye socket to the rear of the main shell, or carapace. 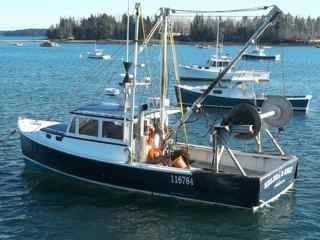 Sternman: The person on a lobster boat that empties, baits, and drops traps back in the water. Soft Shell or “Shedder”: A lobster who has recently molted. They have less meat, but the meat is easier to get at since the shell is easier to break open. I don't need to write for anyone but me today. It is late - early Sunday. I don't write today. So. I should have written something earlier to schedule and I didn't. So. Here is Off Today. Which is what I am. This of course, is a photo from summer...not now! See you on the boat tomorrow! Today is the letter R for the A to Z Challenge. 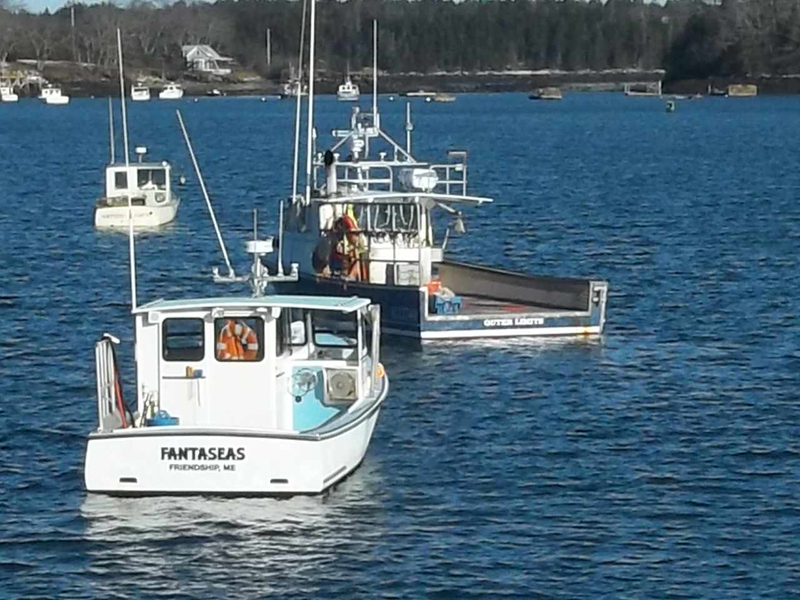 The first two pictures are ones I did not take, but was given to use for this challenge by a local high school student who also does lobstering. To moor safe at home. Roe = also called coral because of its red color. It's found in the female lobsters only, as it is the unfertilized eggs. 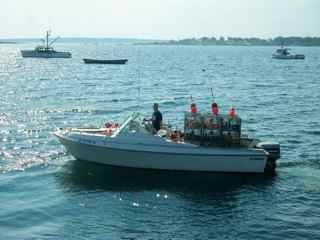 Races - Did you know we have lobster boat races? Exciting as NASCAR! And there are quite a few spread out over the summer and the coast. 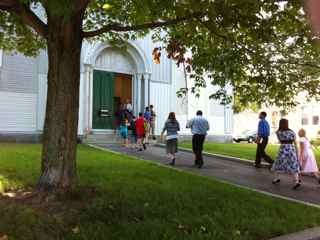 If you happen to be in the neighborhood, try to catch a glimpse of one. Click on Races to find out when and where they are happening in Maine. on the occasion of the Blessing of the Fleet. 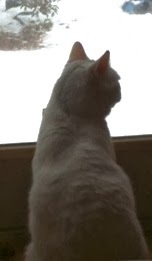 Double duty today - It's Poetry Friday Roundup over at Live Your Poem with Irene, and it's Q-Day in the A-to-Z Challenge. 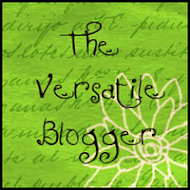 After your visit here, pop on over to either place for some quality blogs! Quick Step's picture was not taken by me. I'm going to try to get one of my own shortly! Let’s do the whole the list! 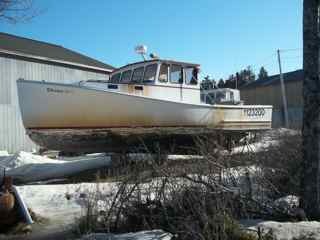 Queen B is the name of a lobster boat on Chebeague Island. 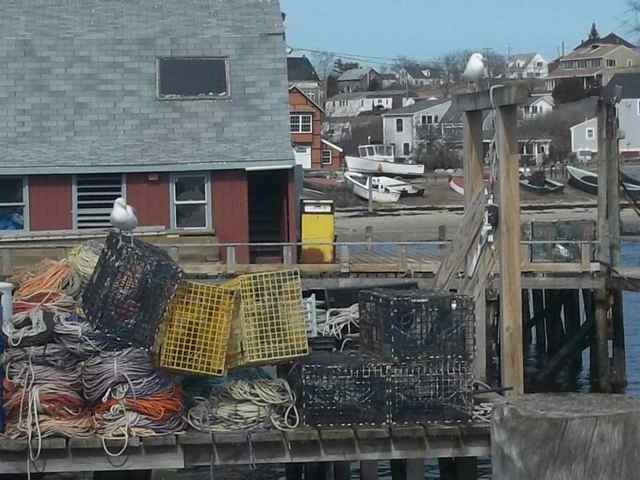 He's selling lobsters here, so you will have to ignore that it is a sales pitch until I can locate him and get a picture of his boat. I don't really want to take a trip out to Chebeague, but I'll do what I have to do. 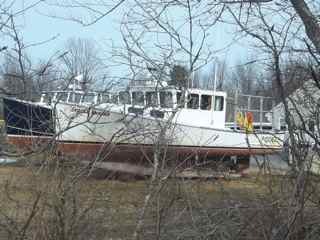 Queen's Lady - she's on the water now, so I can't get a picture of my own unless I find out when he's coming to dock to unload. And Susie Q I think her name is...saw it driving by and could not get an easy picture, due to twisty and hilly roads and perpetual traffic (well, here that means someone could come over the hill any moment, but you don't know when that moment will be, so you don't dare to stop) I'm going to try again, though it isn't really a Q. Added a new tab today, "Poet Tree". I think I'll try to make a spot for poems no matter what my blog post is. Here's a first instigated by Joy at Poetry for Kids Joy. Stay tuned for the elusive Q! Pistol = a lobster that has lost its claws. Fortunately, they do regenerate their claws. Pegs = lobstermen used wooden or plastic pegs inserted into the base of the claws to prevent lobsters from opening them. Now they band them with rubber bands to keep their claws closed. P is for Psalm. I thought it an interesting rewrite...don't know who wrote it, but given to me by a teen lobster(wo)man - preferred term is lobsterman. I shall dread no danger, for Thou are near me. Thou anointest the waves with oil; my ship rideth calmly. Today for the A to Z Challenge (click on tab above for over 1000 links to more participants) is the letter O. 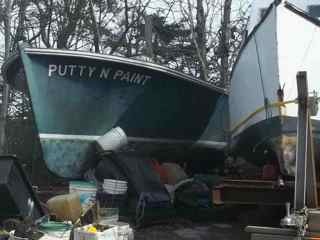 And for those of you starting to paint the letter Q on your newly acquired lobster boats, well, you can keep painting that name "Quinellybelle" or "Quidley Squidly", BUT I FOUND ONE. Yea! Actually I found three, but I only have a picture of one. So Friday is the big Q day...finally, I can almost rest. Only one left. Z. But I have high hopes that a Zebra will show up! The letter O, for "Obsession" and "Outlaw" and "Outer Limits"
Go where you must be! You now live for this thrill. But actually I'm quite nice. 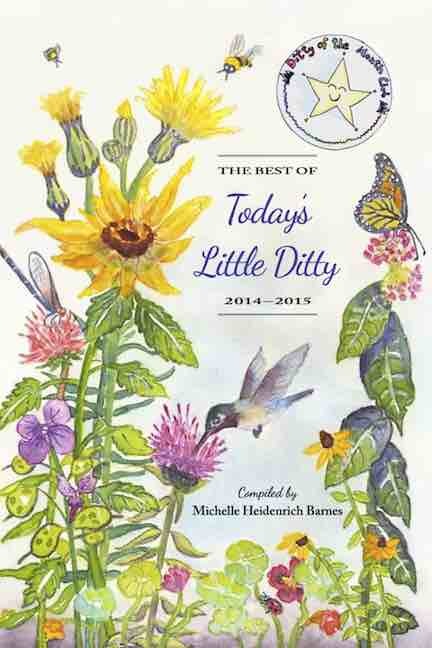 A to Z Challenge (see tab above or link to the right) and Slice of Life Tuesday today! Three boats and three poems for today! N is getting along in the alphabet. I need a Q boat name for Friday! 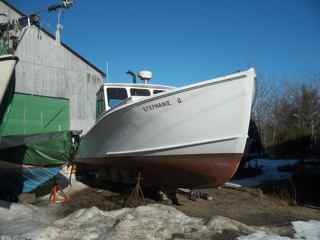 And a U for next week, though I kind of found a U name... no picture, but a lobster boat name from years ago. 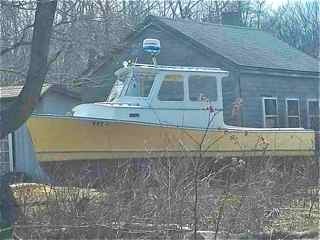 SO, if you have a boat you haven't named yet, I think you ought to name your boat Quick Quixote or Quilly Wonka...Ultra Sultry or Utterly Ugly...anything with a Q or a U! 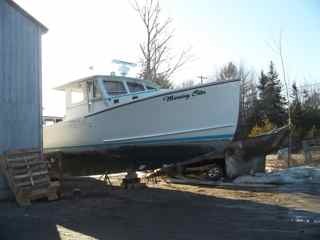 Then paint the name on it, move to Maine, take a picture and send it to me. That should be easy enough to do for next week. And I think dedicated readers SHOULD be willing to do this, for the sake of blogging integrity. Any Z name would be fine, also. Suggestions: Zed's Meds, Zealously Jealous. Don't make me resort to buying my own fleet! Oooh, a copy of PhotoShop would be cheaper! The wind and waves sigh. Nadine Rae, what did you say? "It's time for work and not for play." Nadine Rae, why can't you wait? "Get your boots and get your bait." Nadine Rae, why do you nag? "Grab that gaff and bait that bag." It's time to go, I know, I know! "Best be quick, or I'll make you row!" New-shell lobster = A lobster that has recently molted (see M), and whose shell is still very soft. These aren't usually for sale. They are softer than a "soft-shell" (see S next week), which is sold. These do not get bands put on their claws because they are so soft they can't damage other lobsters in the holding tank and the bands could crush the claws. Wow! Five boats, five poems! 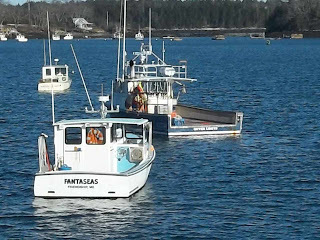 There were lots of M lobster boats that I found around here! Check other A to Z posts by clicking on the link in the tab above! I'm moored with a vine. The end of my quest. I'm with My Girls at sea. Molting - A lobster sheds up to 25 times in the first 5 years of life. The adult lobster molts about once a year. When it molts the lobster's shell cracks along the joint that separates the carapace and the tail and along a line down the middle of its back. The lobster lies on its side to pull itself out of the cracked shell. If the claws get stuck in the knuckle of the claw during molting, the lobster must throw that claw. The old shell is a perfect double of the lobster. The lobster eats its old shell to help harden the new one. A newly-molted lobster feels rubbery. If it is lifted from the support of the water, its heavy front claws may drop right off. It stays in hiding for a week or two until the new shell is fortified against predators. Click on the A-to-ZChallenge tab above to go links to more A to Z posts! Today's post from me is brought to you by the letter L! First up is "Lil Dipper" and below an original poem for her. 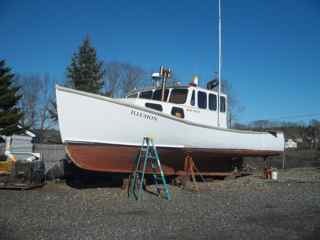 Then there is Lasca J, a slightly larger boat with her own original poem. There's no one catches me! I'll beat you in any race! Who know me by name. is not a berried female. has no V-notch, nicks, grooves, or indentations of any kind along its edge on the female tail flipper. Live-tank or Live-well = A tank filled with seawater to hold live lobsters. I'll be posting on Sunday, though it won't be a lobster boat poem. Sunday is a day off from the A to Z Challenge, but it will be a poem, and there will be pictures related to lobstering and Maine, so come on back then! It's Letter K Day for the A to Z Challenge (see tab above to go to more great A to Z posts), and it is Poetry Friday. Thank you, Diane, at Random Noodling for hosting today. Coils of rope my hair. My heart is my crew. The smaller the old, the larger the new. Prepare us for launch, when deadlines are met. Sisters will dance again o'er the white caps. Lobstering can kill you, literally. Ropes and moving traps are always a danger. Fishermen always carry a knife for cutting lines in case a foot gets caught in the ropes and they get carried overboard with traps. Watch a scary lobstering trip (YouTube), with a good ending. Cut. Revise. Cut. Paste in a different spot. Cut. Add. Edit-Undo, Edit-Undo. Rewrite. Add. Think. Think. Admonition to self - "Stop thinking and just see, feel and write". Cut a bit, move a bit. Done. Whoops! One more word change. So the first poem just under the picture is old, below ~~~~~~ is new and revised. And then tossed back in. And now that I see both together, the second one is nothing at all like the original. That's good. Do you agree? Or do you prefer the first? "But I see three poems here," I hear you saying. Okay, just came back to this, this morning, and did some cutting and resulted in #3. That's my pick. What a transition! I think I'm finally happy with it. Less is more here. J is also for Just Do It. I like revising. Do you? Have you ever started with a poem or piece and messed with it so much that it ended up totally different? Jumbo: A lobster that weighs over 2-1/2 pounds. A to Z - Today is I. Or should that be, today is me? No, I. 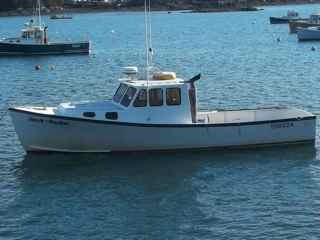 This lobster boat is named after the two " girls" in the lobsterman's life, as is custom. Indigo - sometimes, like once in 2 million times, you may see a blue lobster. I've got to eat more lobster. I think I'm about halfway to 2 million now and haven't seen one yet! Each day in April, except for Sundays, we are challenged to write on a topic that begins with the letter of the day. Sunday will have a poem maybe topic related or at least Maine stuff, but not assigned a letter. Click on the AtoZ Challenge tab above and visit more bloggers participating in this alphabetically challenging month! 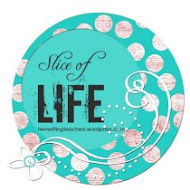 It's also Slice of Life Tuesday, so head over there when you are done here at the shore! 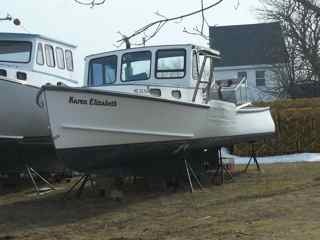 My topic is Maine Lobster Boat Names...with a Trawler or two thrown in for missing letters. 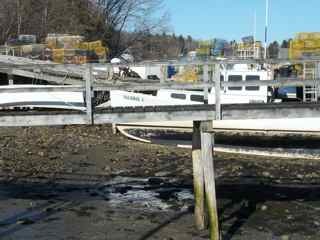 Photos are all taken by me, of boats on the coast here in Maine. 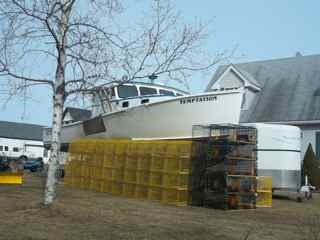 They are mostly on land, as this is where they are parked for the winter awaiting warmer days and lobsters to return from deeper waters. It was fun driving around, jumping out of the car, snapping a picture and taking off to find the next one. 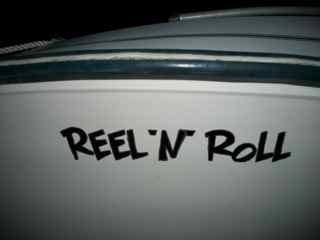 I love this boat! It definitely looks happy! Love the color. It just seems to be smiling. Hands-on Education - Lobster Conservancy Educational page - Lobster Curriculum. Homarus americanus is the species of lobster caught in Maine waters. Hard-shell lobsters = Black mottling on the underside of the claws of the live lobster show that it is in its hard shell. They have not recently molted and you will need nutcrackers or a rock (seriously) to get the shell off after it's cooked. Lobsters exhibit 'handedness'. A lobster could have the crusher claw (dominant hand) on the right side while others will have it on the left. Hen = A female lobster. Hauling traps video (it's long...watch a bit) - not my video...YouTube of a local. Today is G in the AtoZ Challenge. Check out other AtoZ Challenge posts by clicking on the link in my tabs above. There are so many interesting topics that bloggers have picked to write about each day except Sundays in the month of April. 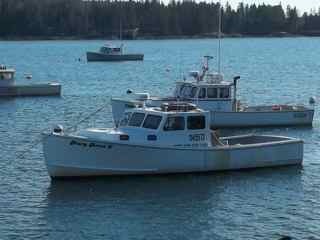 Since it is also Poetry Month, I have elected to write at least a poem a day to do with my topic - lobster boats of Maine. I found one for the letter G! 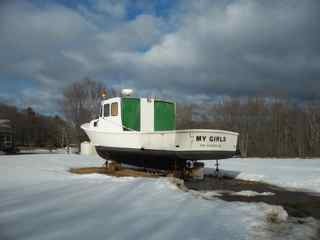 I'd been looking for quite some time for a boat with a name that started with G, so I was pretty excited when I happened upon this one. I still have Q, U, X, and Z to find...but that's not too bad. I'm still looking. From the jaws of my traps. I am posting for the A to Z Challenge every day this month, except Sundays. I don't post on Sundays anyway, but I do schedule posts ahead for Sundays. So here's a new poem for Sunday, an unalphabetically inclined post! And it's not even lobstering. 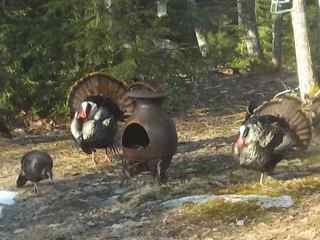 But it is a Maine thing - wild turkeys. Monday though, it's back to lobster boats. So enjoy the interloping turkey interlude. Don't be looking at him! Please, don't ask me to fly. I'll be catching your eye. to want to right now! Seventeen turkeys came strutting across our "lawn" last week. There were three males. The dominant male is seen in the picture fully puffed out. The other almost puffy one attempted a face off with him, but backed down. The third male wasn't even attempting a display! The hens didn't seem too impressed with anyone in particular though. We saw them last spring and a few other times over the summer. There were 16 at that time. Don't know where they picked up the extra, but it is very difficult to count them as they browse through the trees and leaves, brown on brown. Tomorrow, the letter G! I was so relieved to find a G name. It wasn't easy; I thought I'd have to fudge on it! I still don't have U, X and Z! Still cruising around the neighborhoods for those elusive letters. Each day in April, except for Sundays, we are challenged to write on a topic that begins with the letter of the day. Because it is also Poetry Month, I have chosen, for the second year in a row, to write a poem a day. Sunday will have a poem related to the topic, but not assigned a letter. Click on the AtoZ Challenge tab above and visit more bloggers participating in this alphabetically challenging month! 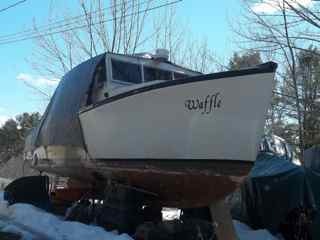 My topic is Maine Lobster Boat Names...with a Trawler or two thrown in for missing letters. 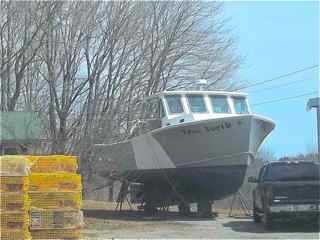 Photos are all taken by me, of boats on the coast here in Maine. 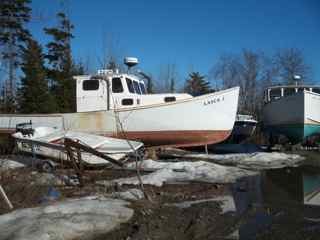 They are mostly on land, as this is where they are parked for the winter awaiting warmer days and lobsters to return from deeper waters. And my boat and me. Some Facts about lobsters at The Lobsterman's Page. Good grief! It is also Poetry Friday! I almost forgot this morning! And I forgot to mention it here. So click on the Poetry Friday link on the side or click here to go to more poetry links. Okay...so far I can't find an E all by itself. 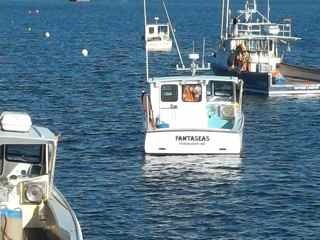 Boats are named for a daughter and wife, or two daughters, or a mother and wife...two special women in the fisherman's life. 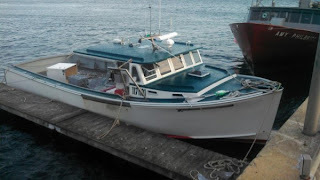 So, since this boat has &; between the names, I felt it totally within my rights as a - I felt it totally within my rights anyway, to just switch the names around for my purposes here! Unless, of course, I find an nice E name shortly, in which case I will adapt this page. But for now it is E is for Emily. And now for the second fudging that I warned you about earlier. This is not a lobster boat. It's a shrimp trawler. The gear on the trawler is different to accommodate the netting. 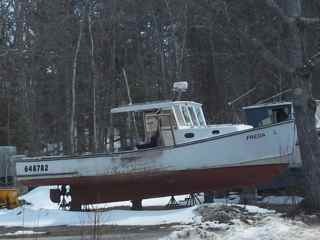 Some lobstermen will rig their boats to fish shrimp in the winter months when they aren't lobstering. To net what's on ground. There'll be a good turn. egger = A berried female lobster (berried means she's carrying eggs). double - Two traps on a single buoy. 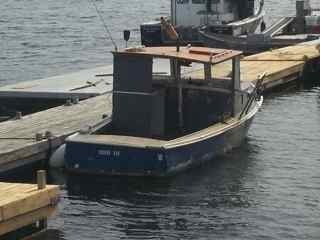 Watch as the lobster boat the Dominator is launched in Portland, Maine. I did not take this footage; it is available on YouTube. Remember to go visit some other great posts now! I'll have a name change. Of wife and of daughter. 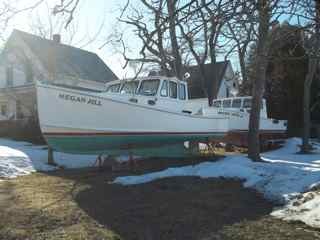 Lobstermen often name their boats after their wife and daughter, mother and wife, or two daughters, thus the two names on many boats. 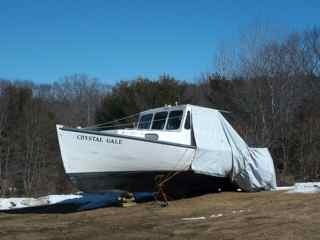 The Crystal Gale was purchased in another state and will be undergoing a name change when she hits the water the first of May. The sides or capes at the mouth of a river, channel, harbor, or bay are chops. A lobster is a crustacean. A lobster missing one or both claws is a cull. The minimum legal size for a lobster is 3 1/4 inches in carapace-length, which is from the eye socket to the beginning of the tail. Shorts are thrown back into the water.